August 28, 2016, 10:22 AM · During the time of Wolfgang Amadeus Mozart, violinists jazzed up the pieces that they played, improvising and showing off when the music came to a cadence -- thus the term "cadenza." These days violinists tend to play cadenzas written by other people, sometimes hundreds of years ago. That takes a little bit of the spontaneity, individual personality and fun out of cadenzas. It also means that violinists are no longer used to composing their own cadenzas. 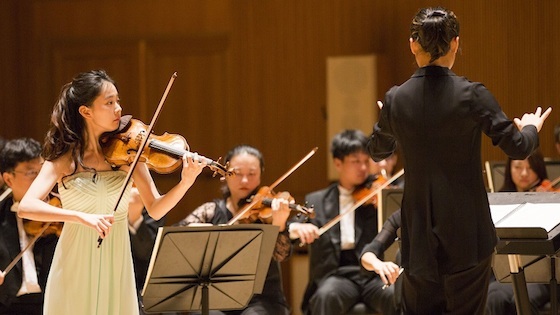 On Sunday, nine violinists played the concerto, and on Monday the remaining nine will play, each accompanied by the Shanghai Symphony Orchestra, conducted by Jiemin Zhang. Sunday's Mozart-cadenza fest began with Kyung Ji Min of South Korea, who set the standard high from the beginning, with a strong performance of the concerto and well-written (if a bit Romantic) and well-executed cadenzas. She sustained the musical line well in the second movement and played some excellent passagework in the final movement. Kyung Ji Min of South Korea. At right is conductor Jiemin Zhang, one of China's top female conductors. Xiao Wang of China, currently at the Manhatton School of Music as a teaching assistant to Lucie Robert, played a springy first movement, with nice interaction with the orchestra during the first movement's call-and-response sections. While he had a few wobbles in his first-movement cadenza, his second-movement cadenza had some nice double-stops that were self-accompanying, like in Bach. As the day went on, I had to muse at what Mozart does in different brains. Though the cadenzas all were inspired by the music in Mozart Concerto No. 3, they took so many different approaches, depending on each musician's imagination and personal inventory of violin techniques. Yiliang Jiang of China began his first-movement cadenza by going straight up the fingerboard, and followed with drama and nice, fast, flourish-y passages. His third-movement was one of the best for consistent tempo -- not chomping at the bit for it to be faster yet still keeping it bouncy and animated. Ji Won Song, currently studying at the New England Conservatory with Donald Weilerstein and Soovin Kim, played extremely well but also played it safe. With her high level of technique and accomplishment, she could take more risks. Yang Zhang of China created some nice spotlight moments, particularly in the second movement, when he molded time a bit and drew the audience in for quiet moments. In the third movement cadenza his incorporation of bariolage stood out as unique. Mayu Kishima of Japan gave a stand-out performance, playing a 1700 Strad. An assertive performer, Kishima seemed almost to be conducting and also putting the orchestra on its best behavior (they were a bit inconsistent throughout the day). Decisive and gutsy, her first-movement cadenza said "listen to me," making use of silence and time, going faster then slower but never losing the rhythmic frame. It ended triumphantly -- perhaps this is her personality? The second-movement cadenza was just as good, with varied tempos and techniques, a balance of fast-slow, smooth-bouncy. Jinru Zhang of China, who has been featured on From the Top, gave a solid and elegant performance. She stood almost inside the orchestra and at times blended in, but this also made for a satisfying level of coherence and collaboration with the orchestra. Her first-movement cadenza had good direction, with moments of fast excitement as well as slowing to a stop. It's easy to enjoy her playing because one feels complete trust in it. Yu-Ting Chen of Taiwan, currently a student at Curtis with Ida Kavafian and Shmuel Ashkenasi, had some problems making her bow speak. Her first-movement cadenza was interesting and well-timed, with nice doubles stops and runs. She created some beautiful moments but could do more to dramatize them. 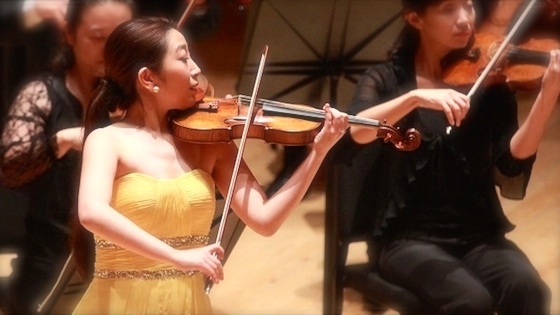 Jee Won Kim of South Korea stood physically far from the orchestra and also seemed disconnected; tempos between orchestra and soloist were often at odds. Her second-movement cadenza was well-made, echoing the orchestra part with self-accompanying double-stops that she played with fullness. 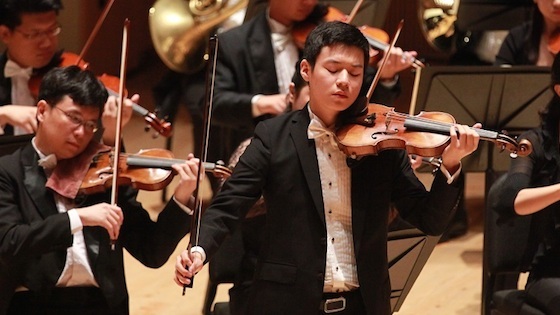 Performances of Mozart 3 with original cadenzas will continue on Monday, available for watching and listening on line on the Shanghai competition website. I look forward to hearing more original cadenzas! Ever since hearing The Butterfly Lovers Violin Concerto so many times earlier in the semi-finals, my goal has been to find some nicely-printed copies of the concerto to bring home for my fellow violin friends and teachers in the United States. 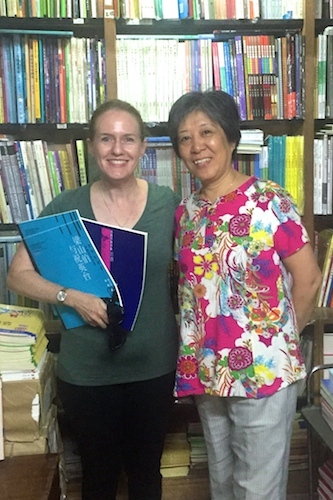 Today while walking to the Shanghai Symphony Hall with Linda Cerone and Strad writer Pauline Harding, we found the sheet music store! The store, Shanghai Yuan-Long Music Shop, was in a rather unexpected place: behind a corner and down an alley, through a tiny back door. We entered through a kitchen, next to stove with all its pots and pans, and through a tiny passage, around corners that were the size of a closet but full of shelves of sheet music, floor to ceiling. Considering the cramped quarters, I did not expect them to have very many copies, but they did! So I bought an orchestra score and a pile of piano-violin versions as well. 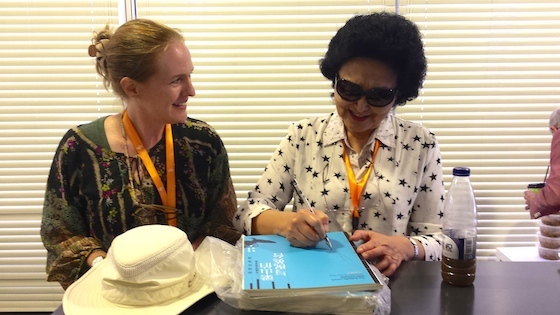 I was thrilled when Shanghai Conservatory violin professor Lina Yu, who premiered "The Butterfly Lovers" Violin Concerto in 1959, agreed to sign the all for me! Here I am, watching her sign her name in both Chinese and English.